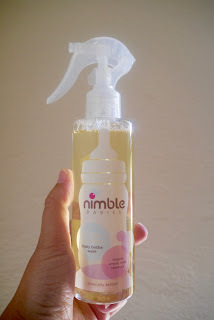 A few weeks ago we were sent a bottle of Nimble Babies Milk Buster to review, which is a cleaning spray for bottles. It targets smelly milk residues and odours and claims to get rid of the cloudiness that often appears on bottles. Ophelia is primarily breastfed but she occasionally has a bottle of milk. Eva also often has milk in a beaker before bedtime and we find those a pain to keep clean. The product is made from the safest cleaning ingredients derived from coconut, sugar and amino acids. Its pH is balanced to be similar to water and it also contains plant-derived products to remove water hardness. It's been clinically tested to be as mild as water. It's very simple to use. You add a little warm water to the bottle and then spray twice inside. You can also use the spray directly onto a teat. You can then either use a brush to clean around the inside of the bottle of just shake it. If the milk has been left in the bottle longer than a day you may need to spray a couple more times. We've been using the product for a few weeks and we are very impressed. It really does make the bottles and beakers a lot cleaner. It's very good at getting rid of smelly odours. I've also been using it to clean the monstrosity that is my husband's protein shake bottle. If you've ever used one of those then you know how smelly and grubby they become. It's a miracle worker on that. We love how simple it is to use. Cleaning bottles can normally be frustrating when you are trying to reach the bottom and remove leftover milk from the sides. The fact that it's a spray allows the product to reach all areas of the bottle that can normally only be reached with a brush. We've been so impressed with the product that we've actually bought it away on holiday with us. The temperature where we are has been at least 35 degrees everyday so as you can imagine the bottles and beakers smell very quickly. It costs £5.99 for 200ml or £2.99 for a travel size which is 60ml. Its lasted us a while but we don't use bottles daily. I would definitely recommend it to anyone. It's a product that you didn't know you needed until you've used it. This sounds great! I used to have a nightmare with the bottles and they were permanently cloudy by the end of their days. Luckily we've moved on to no bottles but I'll keep this in mind for the future for sure! Sounds like a great product this would definitely have been helpful to have had when we bottle fed Blake. Oooh, I will keep this in mind for when my baby arrives in November. That looks good, I can remember cleaning bottles being a bit of a nightmare! Oh this sounds so amazing and what a great idea! That does sound useful - milk can quickly make bottles a bit smelly. This sounds like a really useful product and something that might come in handy. We have bottles which end up smelling (drink bottles) and I've been wondering what to use. this sounds fab!!! i will have to get some of this for my husbands protein shakes too! When he uses shakes that are made with milk they soon start smelling.